"Was America Founded as a Christian Nation?" - Can't wait for this book! In his latest book, Was America Founded as a Christian Nation? 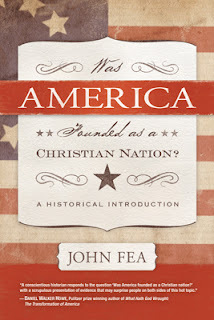 : A Historical Introduction, John Fea confronts the culture wars head-on. With polemicists on all sides wanting to claim the Founding Fathers (and founding era) for themselves, the blogosphere and talk radio are filled with a contentious “he said; she said” back-and-forth, leaving thoughtful listeners more confused than ever. For that befuddled person, Fea offers help. He challenges his readers to think like historians, and presents them with the facts they need to weigh the evidence for themselves. He does an excellent job of both explaining the complexity of the issues and putting them into context. Particularly enlightening are case studies of the religious beliefs and practices of seven founding fathers—three undoubtedly devout and orthodox in their faith, while the other four are questionable in regard to one and/or the other. Fea’s suggestions for further reading will be especially useful for readers who want to delve even deeper into the topic. Those who are ready to move past simplistic answers will be well-served by this thought-provoking work. -Mary V. Thompson, Research Historian at George Washington's Mount Vernon Estate and Gardens, and author of In the Hands of a Good Providence: Religion in the Life of George Washington (University of Virginia Press, 2008). Was America Founded as a Christian Nation? : A Historical Introduction will be available in February with Westminster/John Knox Press. In his essay "Evangelism and Discipleship," found in the book The Word That Redescribes the World: The Bible and Discipleship, Walter Brueggemann does an excellent job of giving the biblical, theological, and ecclesiastical realities of how God calls and sends his people. Evangelism and mission as going hand-in-hand: when God calls, he sends. But to where is God sending us? Brueggemann wisely points out, “it is clear that the sending is not to another place on the assumption that some places have already been ‘won over’ and other places remain to be ‘taken.’ That, of course, was the old assumption of mission that was characteristically ‘foreign’ mission, as it was uncritically assumed that the home base was ‘secure’ for the Gospel” (p. 103). This is an important paradigm shift going on in American Christianity. Many of us are seeing our ministry goal as helping each person in our ministries discover their particular giftings, talents, and vocational callings so that they can (as Brueggemann says) “be dispatched as alternative in every place where anti-creation powers rule, dispatched there to talk the talk and walk the walk” (p. 103). We are to be culture-shapers in this place. We are to bring God's blessing to this place. We are to seek universal flourishing for everyone (Shalom) in this place. We are to overcome injustice wherever we see it, including right here in our place. We are to live as an alternative community, displaying to the world what it looks like when God's way rules, not lording over people but living as Jesus did - through service and sacrifice. That is the "walk." And when people ask us for the story of why we live in such hope, we should be ready to answer them, telling them that God's Kingdom has come near them. This model of God calling and then sending people to do his will of "blessing" to bring Shalom into God's creation continues from the old Testament into its fulfillment in Jesus Christ. Jesus’ call to people in the gospels was to “follow me.” But Jesus also warned them, “Whoever wants to be my disciple must deny themselves and take up their cross and follow me” (Mark 8:34). In other words, “following” cannot be just an add-on, a means for blessing to our current lifestyles. Jesus is demanding that his followers leave the lives that the world offers as the “good life,” and replace it with what God has determined to be the good life. Brueggemann states, “It is clear that Jesus enacts a major claim upon people’s lives that places their lives in crisis, the same sovereign claim that is so uncompromising in the narratives of Abraham and Moses” (The Word That Redescribes the World: The Bible and Discipleship, p. 95). To become a follower of Jesus is to honestly assess the broken, unjust, and oppressive systems of the world and how I personally have capitulated to these systems and have embraced and contributed to their destructive power in the lives of others and of God’s good creation. Brueggemann writes, “God means for us to disengage from the postures, habits, and assumptions that define the world of power and injustice that is so devoid of mercy and compassion in every area of life” (p. 95). This is the radical life into which Christ is calling his people. He wants me, as a leader of a missional Christian community, to direct these people into “an alternative life in the world” (p. 99). This, of course, is not the gospel that most American churches are proclaiming. They, instead, have focused on many other things. My particular church background proclaimed a gospel of individual salvation from eternal damnation and a promise of heaven after one dies. The gospel of the Kingdom is much more holistic than this truncated gospel. It proclaims that God’s original intention for this world will not be thwarted. It proclaims that through Christ, all things will be restored. It offers people the opportunity to actually be used by God to bring healing to this broken world, with the hopeful anticipation that one day God will bring it all to culmination. A look at the Moses Paradigm of "Called and Sent"
Walter Brueggemann, in an essay entitled "Evangelism and Discipleship" in the book The Word That Redescribes the World: The Bible and Discipleship explains that the paradigm for a missional community is that God calls and sends. God calls people into relationship with the Godhead, and then sends us on a mission to “go” into a an intentional life that sets aside our purposes and agendas for the sake of God’s. When Moses is confronted by God, “YHWH issues a series of first-person resolves, all concerning what YHWH intends to do in the face of Pharaonic oppression” (Brueggemann, p. 97). “I have seen the misery of my people… I am concerned about their suffering… I have come down to rescue them” (Exodus 3:7-9). But Brueggemann points out that YHWH does not then say, “Therefore, I will go to Pharaoh.” No, instead (and surprisingly) God says, “So now, go. I am sending you to Pharaoh to bring my people the Israelites out of Egypt” (verse 10). God’s modus operandi is to call humans to himself and then to send those humans to do his mission. Gospel ministry, in this framework, is more holistic than what we’ve seen in North America in the 20th Century. The left side of the Christian church focused mainly on economic justice through social action, while the right side focused mainly on individualistic evangelism and personal ethics. The gospel is not “either-or,” but “both-and” these. When one side of this holistic gospel is emphasized over the other, the gospel is truncated. As the old song goes, breaking up is hard to do. But we must do it. We must move on. And here's a way to do it and help the needy while you're at it. Thanks to a campaign called "Break Up With LeBron," starting Wednesday, July 14th, we can take our old LeBron gear to all Yours Truly restaurants, and they will be sent to homeless shelters in Miami. Everybody who does will be given a one-of-a-kind "It’s not me, it’s you" break up with LeBron tee shirt. You can purchase the "It’s not me, it’s you" break up t-shirt through the BreakUpWithLeBron.com website, and all proceeds will go to my favorite Christian ministry in Cleveland: The City Mission. As they say over at BreakUpWithLeBron, "Its time to get over this. Let’s stand proud and give back." The good folks over at StoneKap Productions have produced this video to help us break up with LeBron. Good job, guys! In a commentary at OneNewsNow.com (from Donald Wildmon's American Family News Network), Michael Youssef seeks to answer the question, "Can there be a Christian nation?" As I read Youssef's column, it struck me that Youssef is confused about the difference between the United States of America and the Christian Nation that is comprised of Bible-believing, Jesus-following Christians, no matter what country they live in. 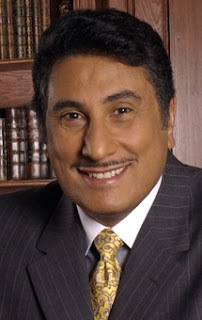 At one point, Youssef says, “A country, or even a culture, cannot be Christian — only individuals can be Christians.” But then he negates that statement by making the case that America is, in fact, a Christian nation, rooted in Christianity, founded by Christians, and that all the citizens of America need to repent and get back to God. To do this, he is initiating "GODSAVEOURCOUNTRY.COM" to return America (and all Americans) to its Christian roots so as to ensure America's security since God "can and will withdraw His protection from a people who once declared Him as their Lord." I agree with this statement whole-heartedly. But he and I apply these “lessons” that we learn from Israel in different ways. Youssef applies them directly to the nation of the United States – “We are being made aware once again of His (God’s) desire for this generation of Americans to return to Him and to the faith of our Founding Fathers.” In other words, today's Americans are like the Israelites who were thrown into exile - we have turned away from the God that founded our nation. I disagree with this way of applying Israel's history to our contemporary setting. I believe that the Bible wants us to not apply the lessons of Israel to any contemporary political state, but only to the contemporary People of God – that is, Christians. Today’s followers of Christ are a “holy nation;” it is not limited by any geographical or political boundary – see 1 Peter 2:9. “As believers, we should know and believe deeply that God desires for our leaders and judges to repent for shedding the blood of the unborn. A loving heavenly Father is waiting for them to repent for approving and sanctioning sins that are abominations to Him. God desires for His children to repent from the spirit of materialism and placing our hope in possessions. But this is not what Youssef is saying. He is saying that the United States, as a whole, is a Christian nation, needing to repent and return to God. He believes that since the United States, as an entire nation, is experiencing “economic woes and national disasters,” and a weakened national security, then this is evidence that America’s relationship with God is off track. While he may say that he doesn't see America as “the new Israel,” his way of applying the Old Testament to America certainly betrays that statement. Youssef is improperly equating the United States with the true “Christian Nation,” that is, the people of God who follow the Lord of lords and King of kings. On this Independence Day weekend, we Christians can be proud citizens of the United States. But we can do this without equating our nation with Israel. As good citizens, we should vote for good laws that reflect God’s creative order, we should advocate for justice where we see injustice, we should pray for the common good of all citizens (whether they be Christian or not), and we should seek to be light in the darkness of a secular nation. As Christians, we will continue to pray for God’s kingdom to come on earth as it is in heaven, by the means of the One we follow, Jesus Christ, who originally brought his Kingdom into this world through service and suffering. As God's chosen people, a royal priesthood, a holy nation, a people belonging to God, on July 4 and every day, we will declare the praises of him who called us out of darkness into his wonderful light. And we will invite our fellow Americans to become members of God's true Christian Nation - the Universal Church - so that they can do so as well. Today, July 1, I am moving my CCO college outreach ministry to a more local place, the campus that contains Stark State College and Kent State University-Stark. God has had this campus on my heart for a long time: a desire to see students at these two schools meet Jesus and join in His cause to bring redemption to the world. There are a lot of students at these schools (9,400 at Stark State and 4,000 at KSU-Stark) with limited Christian influence on campus. After much prayer–seeking God’s guidance, and for a door to open as an opportunity to serve–I have accepted the position of Pastor for College Students and Young Adults at Jackson Friends Church. This means I will remain on staff with CCO and continue to raise my financial support from people who want to see college students’ lives changed through the gospel proclamation that I will provide at Stark State and KSU-Stark. Please pray for our family, especially for our kids, Trey (11), Joel (10) and Kaira (10), who have to transition to a new church after several years of enjoying the children’s ministry at The Chapel. Linda and I have been deeply involved at The Chapel as well. I have led an adult community, helped with the children’s ministry, and also worked in local missions. Linda has worked in women’s ministry and has been a friend and spiritual helper for some women there. We will miss The Chapel! One more concern is that we live in Lake Township, and many of our community connections have been through our kid’s participation in Lake schools and Linda’s Physical Therapy practice here. Please pray that the transition to Jackson Township will not hinder our connections in Lake, and that we will have new connections with people in Jackson. Click the image below for a pdf of this newsletter!